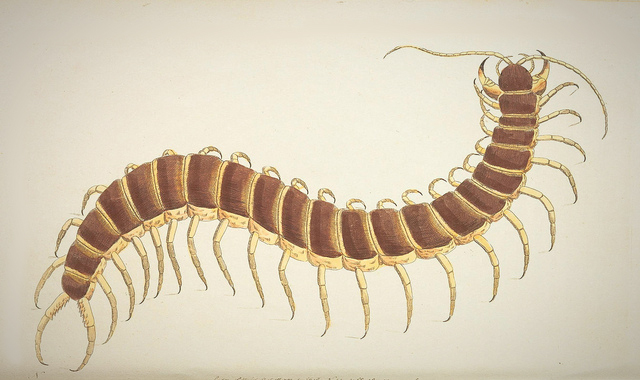 My centipedes are called scutigera coleoptrata, or fearsome creature, an elegant name fit for hunters. Like others before me, I observe them, live and sleep with them. In 1902, entomologist Charles Lester Marlatt observed that they can “often be seen darting across floors with very great speed, occasionally stopping suddenly and remaining absolutely motionless, presently to resume [their] rapid movements.” They are insectivores. They eat the other things that crawl in the hidden ecology of my basement—silverfish, ants, and spiders. There’s a jungle, a population of predators and prey tucked between the papers littered over the floor and behind my pictures and along the spines of my books, the things that I have dragged with me from one place to the next as I’ve moved. This centipede I see, this live one, makes a path between the cup of pens and the Chinese fan, the book of Kierkegaard quotes and the pink Canon camera. I slowly set down my eyeliner, pick up the closest shoe, watch the creature trek up the wall. It moves behind a picture of my fourteen-year-old self sandwiched between my parents on my Confirmation day. In it, my hair has horrible golden highlights, and my mother still looks young and confident. It’s a strange and rare picture—strange and rare to find the three of us alone in a picture. There are usually others with us. I have six sisters, who make it less awkward, who ease the moments when I try to remember how to be a daughter. I remove the picture slowly, and the centipede is still, her legs grounded in their last seconds. I imagine her life—her aliveness—as electricity zipping through tiny tunnels inside of her. I think of the cells that build her. I imagine her life’s history, just as when I first moved into this basement and became curious about the centipedes’ daily routines. I used to wonder whether they were social creatures. If they commune with one another. If they enjoy one another’s company and jumble their legs together in frenetic confusions of yellow. But then I learned they live isolated lives. I learned they do not even make love. To procreate, the scutigera coleoptrata male approaches the female, and they acknowledge each other warily, their antennae wafting across each other’s. Then, chaste, the male deposits his sperm on the ground and leaves her to gather it up. The little ones, the young ones, have only four pairs of legs. One pair for each segment of their bodies. The first time they molt, they gain another pair. The next time, they gain two pairs, and the time after that and after that. They shed their old selves, emerge stronger with more weapons (they can detach their own legs and leave them behind when threatened—they will destroy themselves for self-preservation). Eventually, when they are full-grown, with fifteen pairs of legs, they molt and emerge with fifteen again. Again they molt. Still only fifteen pairs. Consider: once they reach fifteen, that is as full as they will ever be, as complete as they will ever be, and from that time on, the only change they will witness will be loss. I have to think there are flaky remnants of my scutigera coleoptratas’ old selves all over the room. I don’t clean often enough. But I consider, then, if I have molted selves, hollow shells I’ve left behind. I have a few pictures I put into boxes when I move, then take out to set up again, put away, pull out. A picture of me as a four-year-old, gripping my baby sister in the Adirondack Mountains. A picture of my arm around my ninety-year-old grandmother at my graduation; a picture of my eight-year-old self on a beach in Corpus Christi. Me in a field of pink flowers in Yunnan, China. There’s a picture I always set up; it’s me and a boy I used to know. Our faces are shoved up next to each other, and we look—not happy, not wild or elated. We look content. We did not “conduct business” as the centipedes do. We were less chaste, less cautious. I always rest a different picture over the front of it, a picture of me at a work meeting, because it does not summon any particularly fond or resentful memories. This basement I live in, I live here alone. Alone with my centipedes, my paintings and pictures. And suitcases. In the corner four of them lay, half-empty with their contents stirred and lately forgotten. They speak of both motion and stillness. I wonder which I’m doing right now. Not right at this moment, and not physically perhaps, though I’ve wandered restlessly when I’m afraid of where I’ve found myself. I wonder if living in this apartment, now for two months, represents that moment of shell-shocked staring, assessing the situation, the hold before the drop, the stillness before I dart forward frantically. I think I’ll stay here one or two months more, and then I will move on. I think about the people I’ve left behind, wondering if I’ve left them more whole or in pieces. And myself, am I whole or in pieces. This scutigera coleoptrata I’ve been hunting—I can’t say her death is painless because she has tucked herself into a crack, and the shoe cannot do a clean job. In a moment, a quarter of her legs are torn from her body and she is dragged and crumpled a few inches away, her frayed legs flailing in a final, frantic dance, reaching and curling as bolts of shock stun her wilting body. Some of her legs are left in the corner. Alone, they twitch. I watch for a moment, but I don’t wait for them to stop moving. I fold my own legs beneath me and continue drawing black lines along my eyelids. And out of the corner of my eye, I think I see her. Or no. Not her. It could be another. Could be any other. I’ve killed so many now. Elizabeth Horneber’s essays have been published or are forthcoming in AGNI, Yemassee, Profane, and others. After some time teaching English as a second language in China, she now teaches writing in southern Minnesota. Find her on Twitter at @Lissahorneber.